Burbank, California, February 20, 2009 – It will be raining gumballs for lucky Blu-ray™ player owners when they become the first to own the heartwarming fractured fairy tale Bedtime Stories in a Limited Time 3-Disc Combo Pack on Sunday, April 5, 2009 from Walt Disney Studios Home Entertainment— two full days before its DVD debut. The 3-Disc Combo Pack includes a Blu-ray Disc™, a bonus standard definition disc, plus a special DisneyFile Digital Copy that enables viewers to enjoy the film on an array of mobile devices in their choice of iTunes or Windows Media formats. Also available exclusively on the 3-Disc Combo Pack: BD-Live™ including Movie Chat, Movie Mail, Movie Challenge and Movie Rewards (US only). 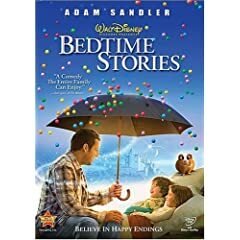 A perfect family gift for Easter or anytime, the 3-Disc Deluxe Edition is available for a limited time only.The single-disc DVD and 2-Disc Deluxe Edition DVD of Bedtime Stories will be available starting Tuesday, April 7, 2009. Brimming with humor and imagination, Bedtime Stories is an uplifting comic fable. The always hilarious Adam Sandler (Click) shares the screen with Keri Russell (Waitress), Guy Pearce (Traitor), Russell Brand (Forgetting Sarah Marshall) and Courtney Cox (“Dirt”) in the heartwarming story of an underdog whose day finally comes. As a handyman at the hotel his father used to own, Skeeter Bronson (Adam Sandler) spends his days changing light bulbs and competing with the hotel’s smarmy manager (Guy Pearce) for the attention of the new owner’s beautiful, hard-partying daughter, Violet (Theresa Palmer). When his sister Wendy (Courteney Cox) asks Skeeter to babysit her kids for a week while she’s out of town, Skeeter entertains his niece and nephew with elaborate, original bedtime stories that transport them to exotic locales, including ancient Greece, the Wild West and outer space. When he tries to help his family by telling one outlandish tale after another, it’s the kids’ unexpected contributions that turn all of their lives upside down. Full of imaginative special effects and good-natured hilarity, Bedtime Stories is a winning combination of comedy and adventure. below. Last date for entries is April 5, 2009.